Voltage, Resistance, and Current are three fundamental components to electric circuits that our technologically savvy world has been built on. They are responsible for all of the technology we take for granted today and luckily are closely related with one simple equation, called Ohm's Law. V=IR is alternative form of Ohm's Law. Voltage measured in volts, is an electromotive force (EMF) or potential difference in electrical energy. Electrons move incredibly fast and in incredibly random fashion, but when a potential difference is present from one area to another then an electric field has been established which will slowly drift the zillions of electrons across a wire or other medium. The voltage or potential difference is responsible for current moving in direct current circuits. When you buy batteries for your TV remote, cell phone, and flashlights you are usually looking for a specifically sized battery, but more importantly an accurate number of battery cells to create the voltage demanded by the component that will use them. For example, AA batteries have 1.5 volts. So, the potential difference across the terminals of the battery is 1.5 volts. Most circuits require more than 1.5 volts, that is why most appliances, toys, remotes, use 4 (6 volts), 2 (3 volts) and sometimes 6 (9 volts). In most circuits, the voltage source is constant like how resistance is a constant opposing force to the flow of current. Volts, the unit for measuring voltage is symbolized with a lower or uppercase: v = V = volts. Voltage is sometimes symbolized with a E in equations to avoid conflicting with the voltage unit symbol, V or v.
Electric Potential vs Electrical Potential Energy! These are different types and sizes of resistors. Resistance, measured in ohms, resists the flow of electrons as they travel from high to low electric potential regions of a circuit. Resistance is present in any and every object you can think of, but in the case of most metals, the resistance is very close to 0 ohms, thus a great conductor of electricity. Before the transistor (transforming resistor) was invented, resistor values were always constant, regardless of the current of voltage they were opposing. However, the transistor (transforming resistor) allows the resistance from its pins to change value depending on an input current. For more on transistors go to my post, "Transistors Should Be Easy!" Find the resistance of your tongue! Resistors are electrical elements used to establish a higher value of resistance in a circuit. For example, you should never hook a 9V battery to an LED (light emitting diode) because it would explode. You need a resistor to limit the amount of current reaching the LED (light emitting diode). Resistors in series add up to create higher amounts of resistance on a specific part of a circuit. Current, or the flow of charge, is measured in Amperes (A), and is symbolized with a capital "I" in equations and formulas, alike. Current can be thought of as voltage/resistance in almost all respects. One Ampere is equivalent to a one coulomb/second. So you can also describe electric current in terms of coloumb per seconds. The "I" stands for Intensity of electric current, because an ampere is about six quintillions of electons traveling through a point of conduction per second. The "I" also avoids conflict of current with C which stands for specific heat, and also similarly could imply Celsius. People seemed to have enjoyed the Troll Meme Compilation post I had posted a few months ago, so I thought it only makes sense to have a rage comic compilation post as well! In this post I also left a link to a site where you can create your own rage comics at the bottom of the post. Cheers to life and laughter! Comment on this post and share your personal favorite rage comic with the W7R community and me. On W7R you do not need an account or username to comment. Click here to make your own rage comics for free! See more of W7R's Top Rage Comic Compilations! Simplifying your programs code is important because it can decrease the size, speed, modularity, and flexibility of your program. Most of the time simplified code can be easier to read. For this post I will entertain two simple, but effective solutions to eliminate unnecessary (extra) code. Explanation #1A I have eliminated the repeated code "private int". This works because private int is a declaration of a variable type which can be shared by using commas. //mailBoxes is mailBox1, mailBoxes is mailBox2, ect. Explanation #1B I eliminated not only the extra declarations, but have also decrease the number of variables references in my program. There originally were 5 references, and now there is one, mailBoxes, which points to an array of integers. An array is simply a list of some data (normally all of equivalent type). Explanation #2A Booleans are already conditional values, therefore do not need any comparison operator to verify their state in the if construct. Afterall, they are either true or false. Explanation #2B Elimination of a variable declaration can save memory, and a small instance of time in addition to making the code easier to read. Believe it or not you already have the ability to do modulus division. In fact you do it every day. Remember in elementary school where division either worked "perfectly" or had a remainder? In middle school and highschool you toss the remainder and find answers in terms of decimals and fractions instead of remainders. The poor remainder has one last opportunity to impress you, in it's simplification of modulus division. -Set up a long division problem with the top and all. -Solve the problem with remainder r.
In this post, I have coded 20 Math.random manipulations in Java for you to access such as recieving a random card out of a deck of 64, selecting a random color (aprx. million colors), and some more simple applications like generating a percent (0% to 100%). Enjoy! If there are any errors at all or if you want to suggest or request another manipulation email me at w7rdotblogspot@gmail.com or simply comment on this post. The while loop is the simplest of the loop syntax available to you as a Java programmer. The general idea is if a condition is true, then repeat til it is false. The only additional detail to make the idea complete is that the condition is checked before and after every loop. The information provided will help you understand what the computer you are buying really is. I provided several questions to ask the salesman at the computer store to make sure you are buying what you want and need for a low price. Going to the store without this would be passing up a minimum of $100. Salesman work on commission which motivates them to sell you products the most expensive selections and devices whether or not you actually needed it. -More GB (Gigabytes) is better because it provides more space! -Will the company offer you a warranty? -Is there 24 hour help? -Is the company a well known brand that you can rely on? -All computer companies exaggerate their laptop battery life. What ever it promises, think half. -Windows 7, Mac OS X, Linux? -Mac is most user friendly and easy to understand, but Windows is the perfect balance between real computing, and friendly bunnies. I wouldn't get Linux without knowing about how it works and its positives and negatives. -Can it use SD cards without an adapter? -Can it use memory card sticks? -Can you easily access and change or add a hard drive? -How many audio jacks does the computer have? This list can help you purchase the best computer for you for a low price! Images appear on websites because your internet browser reads HTML that contains an <img> tag with an attribute, src, which describes the location of the picture (the link address). "File Location" is the URL (Universal Resource Locator) for an image. Short and sweet, if you want an image on your site from Google Images you should right click the image and select "copy link address" or "copy image URL" and paste the link address inside the double quotation marks. The image tag does not have a closing tag, but instead, a forward slash / in the tag before the closing angle bracket, >. For more about Images in HTML: Click Here! See more of W7R's HTML Lessons! Let's begin with an example of a link coded in HTML. *open in a new window to avoid leaving this page! Open me in a new window! The link above sent you to my youtube page. Here is the HTML code I used to create the link. The tags <a> and </a> ~These are anchor tags. The attribute href ~This is an attribute of the anchor tag. Google is a good site. Isn't it? Incandescent bulbs are the same type of light bulb built (not invented) by Thomas Edison back in 1879 (Did you know Thomas Edison Did Not Invent The Light Bulb). The incandescent light bulb has many different shapes, as do all of the common light sources of this article, but incandescent bulbs tend to be glass like clear, round, and have a fine piece of wire bent into zigzags in the center. The zigzag piece is called a filament. When the filament is heated by electrical current it emits light and heat. Incandescent bulbs are still in use today, but are the least energy efficient of the three bulbs we will compare. This is the lightbulb that has been gradually replacing traditional incandescent bulbs in recent years. The CFL bulb is spiral shaped (most often) and is considered eco-friendly by the majority of people. These bulbs have been recorded to save 80% more power than incandescent bulbs. But, a big problem with CFL bulbs is that they contain about 5 mg of mercury per bulb. Enough exposure to broken CFL bulbs could present serious health problems such as brain cancer. On the upside, CFL bulbs can save you money on your power bill. On the downside, CFL bulbs need to be used with more care than the standard incandescent bulb. LED stands for Light emitting diode and is an important component for modern day electronics and environmentally friendly standards on the rise. Most appliances and devices that have lights built in with them show that they are powered (turned on) with a bright red or green LED. LEDs are not limited to the colors red and green, and are powered by D.C. (direct current) electricity. 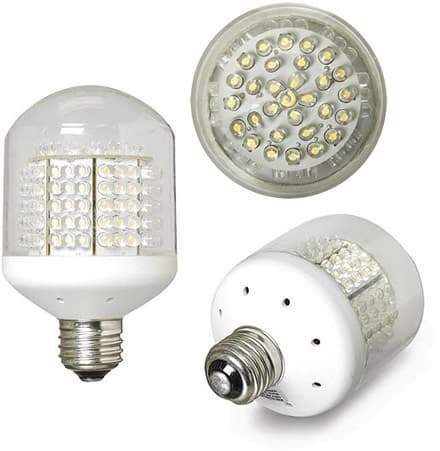 The LED type light bulb is a collection of the relatively small (5mm / 0.05cm diameter), LEDs. LED-type light bulbs are the most effecient at converting electrical energy to radiant (light) energy. However, the thermal energy lost in incandescent bulbs served a greater purpose that was long misunderstood. WHICH IS THE REAL "LIGHT" BULB? Clearly the LED is the most efficient at converting electical current into radiant (light) energy as oppsed to the incandescent that is more a "thermal" bulb than it is a light bulb. In between the two is the CFL (compact fluorescent light bulb). Street lights are on all day and all night directing traffic, regardless of the season. In winter the incandescent bulbs work well, so why would not the LED type do the same in addition to saving energy and money. Well, in winter it snows, and street lights get covered in snow, leaving street lights unrecognizable. Incandescent bulbs melt the snow off due to its 90% thermal energy conversion, but LEDs do not have enough thermal energy to do so. Since, that initial problem, streetlights in some areas in the United States have little hat like over hangs to keep snow from blocking LED street lights. Another problem involving the decrease in thermal energy from light bulbs is that houses will need to power their homes with more AC (air control) and heat to reach desirable temperatures in the winter and fall, in which would crank up an ugly energy bill.